As we approach the holidays, saving money right now becomes key for most of us. The good news is, it is easy to save cash quickly with just a few basic steps. I thought I would share a few of my favorites with you today please feel free to add your own! Cut Your Grocery Bill in Half: This one is easy, simply shop around what is on sale and use printable coupons to help cut the price even further. Those two steps can save you up to 80% on your grocery bill which means instant savings in your pocketbook. Earn Gift Cards, Rewards & Samples: Participating in offers could land you plenty of free gift cards, samples and rewards you could use towards this busy shopping season. Use legit websites such as MySavings.com to find the best and most current free reward and sample offers. Start Selling: Now is the time to purge! Go through your home and find items you could sell online or in Facebook groups. Selling on Facebook is super hot right now and you can easily tap into that plus make extra cash for yourself. Earn Amazon Giftcards: If you haven’t signed up for Swagbucks, you need to, this one has been around for the long haul and they make it super easy to earn free gift cards to Amazon. In fact, this is one of the best ways I save money and shop during the Christmas season. Reset Your Budget: Think about how you shop over the holiday season, maybe it’s time to change up the family gifting to “only buy for the kids” or a $25 limit on each person. Think outside of the box, for our family, we bring one gift card and do an exchange. It’s fun and it keeps us from overspending. These are just a few easy things you can do right now to save cash. I do believe keeping balance is also key, sometimes it is easy to go overboard on our kids or our spouses. Nice things are great but so is quality time and beautiful memories. I have had my eye on a glass door for quite some time but I’ll admit, I have not been fond of the price. That being said, my husband and I have been on the hunt for a deal. We logged on to the website and scored a gift card for 20% off! I purchased the gift card then went to Lowe’s to purchase the door, in the end, I saved $120! I am so excited, I get the door I’ve had my eye on for months and I scored a great deal in the process. That is how easy it is to save money using discounted gift cards. After a simple search, I discovered exactly what I needed, purchased the card and picked up the savings. The next time you make a purchase, go grocery shopping or just want to look around, visit GiftCardGranny.com first! Now that Christmas is over, many of us are heading out to use our gift cards. I love receiving gift cards, it certainly keeps from getting a gift that simply goes to waste or ends up in the “regift” closet. However, every once in awhile, I get a gift card I won’t use. It could be a store I don’t normally shop at or a restaurant I can’t eat at (I’m gluten free, my choices are a bit limited). Either way, there’s nothing worse than a wasted gift card. Now, I can sell my unwanted gift cards for cash! Simply visit GiftCardGranny.com, click on Sell Gift Cards and enter the merchant or store on your gift card to see which exchange site will offer you the most cash. Currently the top sell percentage is 93%! You should generally receive payment for your gift card within 3 to 7 business days. That’s how long it will take the broker to verify the remaining balance on the card and send your payment. How easy is that? 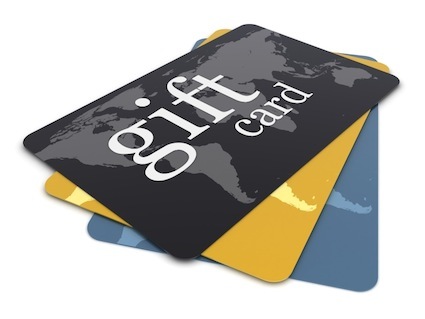 There is no reason to throw that gift card in a drawer, visit GiftCardGranny.com and get cash quickly and easily!